"Workers need a living wage"
SPRINGFIELD – State Senator Christopher Belt (D-Cahokia) released the following statement today regarding his vote to increase the state minimum wage to $15 by 2025. If approved and signed by the governor, it would be the first minimum wage increase in Illinois in a decade. BELLEVILLE – State Senator Christopher Belt joined Gov. 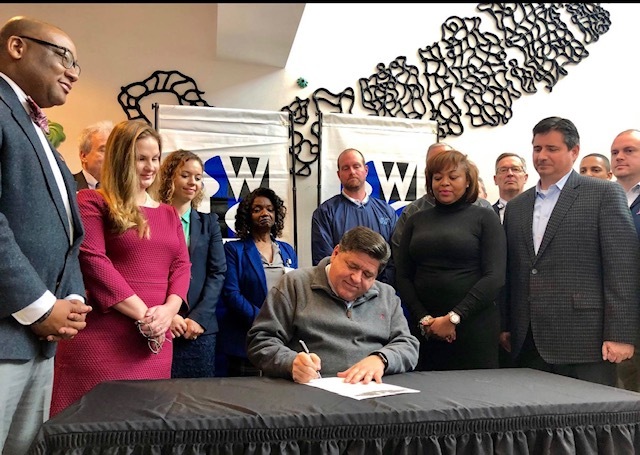 JB Pritzker to voice his support for a plan that will benefit African-American and low-income Metro East residents through expanded job training opportunities. Belt (D-Cahokia) joined Gov. JB Pritzker at Southwestern Illinois College in Belleville as he signed an executive that will strengthen the state’s workforce development and job creation. 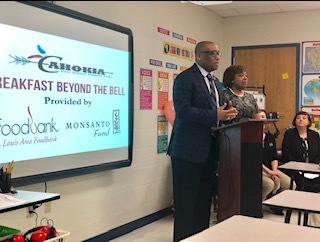 CAHOKIA – State Senator Christopher Belt is commending local school leaders for starting a Breakfast Beyond the Bell program to help students get a nutritious start to the day. Cahokia Unit School District 187 is starting the free and reduced breakfast program, which is federally funded and will provide breakfast to students who cannot afford it on a regular basis. The St. Louis Area Food Bank supports the program and will provide a variety of breakfast items to more than 1,000 students two days a week.